Your safety and comfort is important to us. Please read through the rules and regulations. Please see individual schedules for additional Terms and Conditions applicable to specific events. All entries at competitor’s own risk. Solihull Riding Club and/or the organising committee cannot be held responsible for any accident, damage, theft, injury or illness to horses, ponies, riders, owners, grooms, ground spectators or any other person or property whatsoever. Everyone visiting the Riding Club is required to comply with the Health & Safety Policy to ensure not only their personal safety but also that they do not place others at risk. The organiser of each event takes reasonable precautions to ensure the health and safety of everyone present. For such measures to be effective, everyone must take all reasonable precautions to avoid and prevent accidents occurring and must obey the instructions of the organisers, officials, and stewards at all times. Children must be under the supervision of a responsible adult at all times and adults are expected to take due care. Notices displayed on the premises identify LEGAL REQUIREMENTS for the safety of everyone present. These and the 20mph speed limit MUST be complied with at all times by Members and Visitors WITHOUT EXCEPTION. Failure to comply could have serious consequences and will NOT be tolerated. Dogs must be kept under control and on a lead where and when it is appropriate. Please also note that SRC operates a ‘poop-scoop’ policy where we ask you to please clean up after your dog – bags and bins are provided at strategic points on the car-parks. No person shall allow a stallion for which he/she is responsible as owner, lessee, authorised agent or rider to compete or be prepared to compete, in any competition without taking adequate precautions to ensure other competitors or members of the public are not put at risk of injury. All vehicles parked at owners risk – please do not leave any valuables on show and to avoid disrupting emergency vehicle access to and egress from the Riding Club and adjacent Hotel DO NOT park on the driveway. A solid undamaged properly fitted BSI-approved riding hat/helmet bearing the CE mark and certified to BS-EN1384 PAS-015 ASTM-F1163 or above with more than 2 attachments and straps properly adjusted and fastened must be worn at all times when mounted. Correct riding footwear must be worn – trainers and wellingtons are NOT regarded as acceptable footwear. 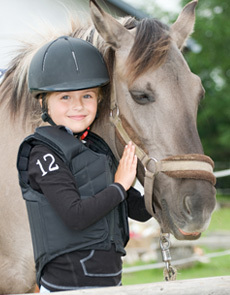 A body protector is MANDATORY for cross country events and highly recommended and encouraged for showjumping and riding around the grounds. Members are required to wear MEDICAL ARMBANDS when riding on the grounds. ACCIDENTS CAN HAPPEN! We recommend that you do not ride on the grounds unaccompanied.